Rural clinics in Sierra Leone provide essential frontline services. The country’s high child mortality rate is mostly comprised of easily treatable illnesses such as diarrohea, measles, malaria, and malnutrition. Rural clinics need to be able to act quickly to treat these conditions. In Sierra Leone 65% of deaths in under-five children are caused by malaria, with people often turning to ineffective traditional remedies or waiting too long to seek assistance because of the real and opportunity costs of securing treatment. 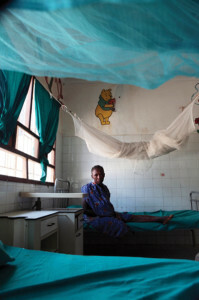 Well-resourced and accessible rural clinics provide life-saving treatment for some of the most vulnerable communities. MASL provides support to selected clinics to increase their capacity to treat patients. We supported repairs to the Mamanso Sanka Clinic, a large rural clinic in Tonkolili which offers support to the community, including pregnant mothers and newborns. This clinic sees about 400 people a week. We support hernia operations at the district hospital for selected patients coming to the MS clinic and provide essential supplies. nr Mano Dasse, and distribute mosquito nets for pregnant women, nursing mothers and children under-five. Support for education and information campaigns related to the above.